Hope you enjoyed all the water color goodness the Lulupu team brought to you all month long! 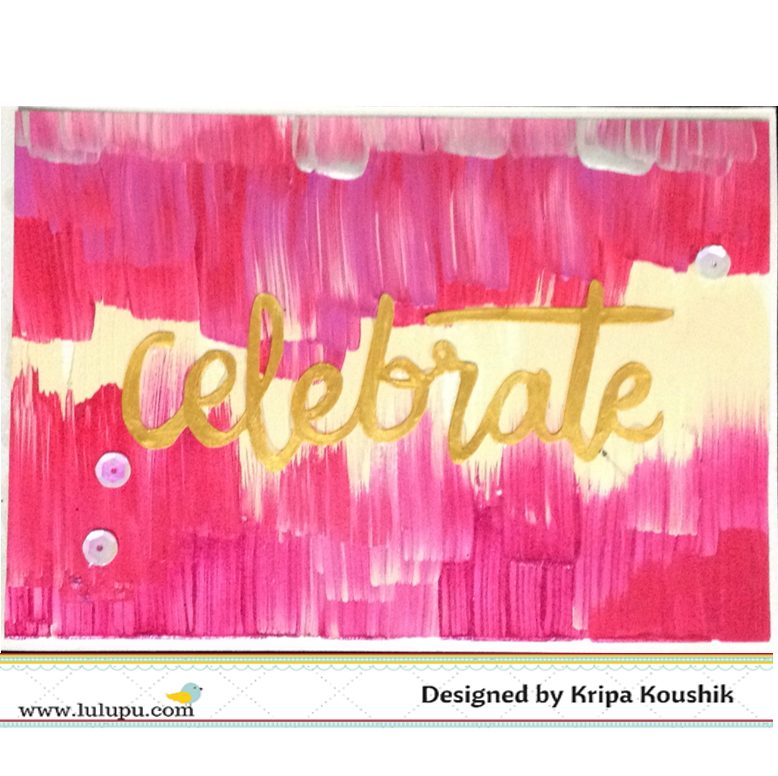 In this final post for the month I am sharing this simple card made by coloring a stamped image. The card started with a beautiful Justrite background stamp, stamped with black archival ink on smooth cardstock. I colored the images with Cretacolor pencils using baby oil & stump to blend the colors. 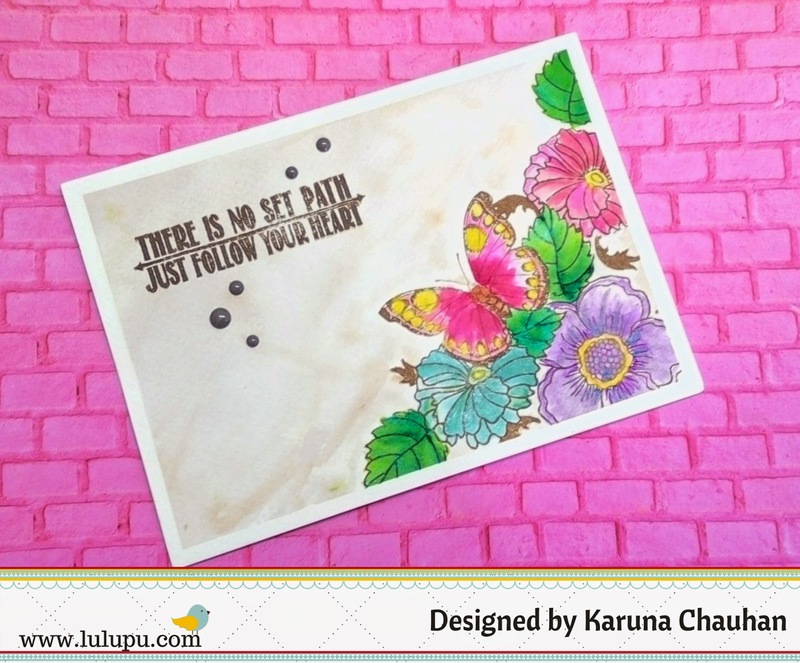 I also stamped the butterfly image again & colored this with spiced marmalade distress ink. To add interest to the butterfly wrapped some golden string to the body & popped this butterfly over the blackground image with foam tape. Distressed the edges of the entire image with spiced marmalade & abandoned coral DI. This was then layered over black cardstock. A big hello to all of you!! 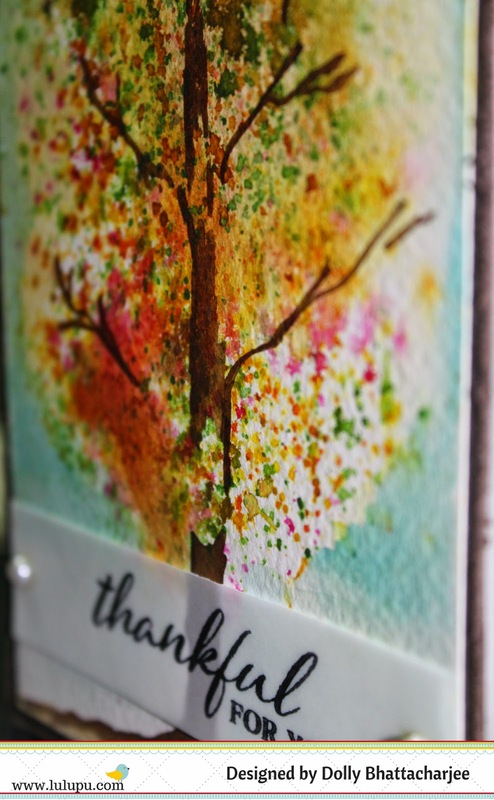 Hope you are enjoying the month of April with loads of watercoloring techniques being shared by the DT members. Today I have a super simple watercolor technique to share with you all. These are some of the beautiful results I got by using just 3 primary colors - Yellow, Blue and Red. The tutorial is really simple, all you need are the watercolors, a round paintbrush, watercolor paper, a mini water spritzer and heat gun! 1. 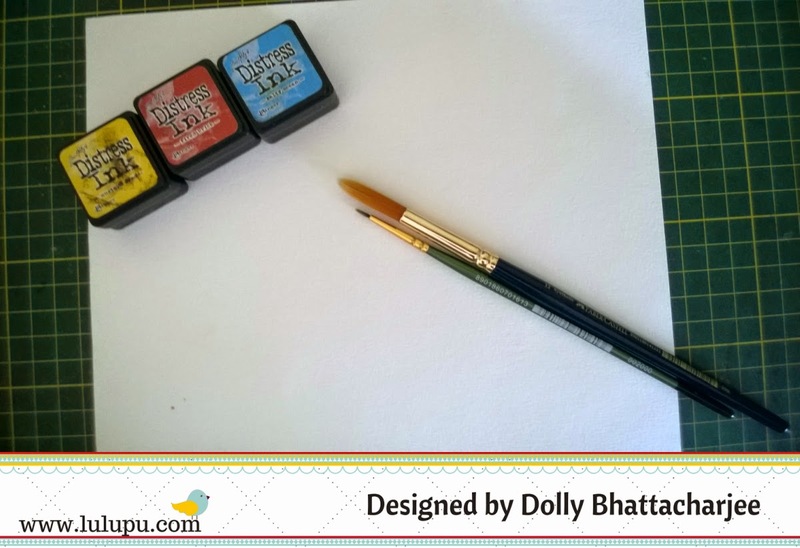 Start by tapping watercolors onto the watercolor paper - Yellow, followed by Blue and finally by Red. I would suggest you all to practice the tapping on waste paper before you finally get a hang of it. 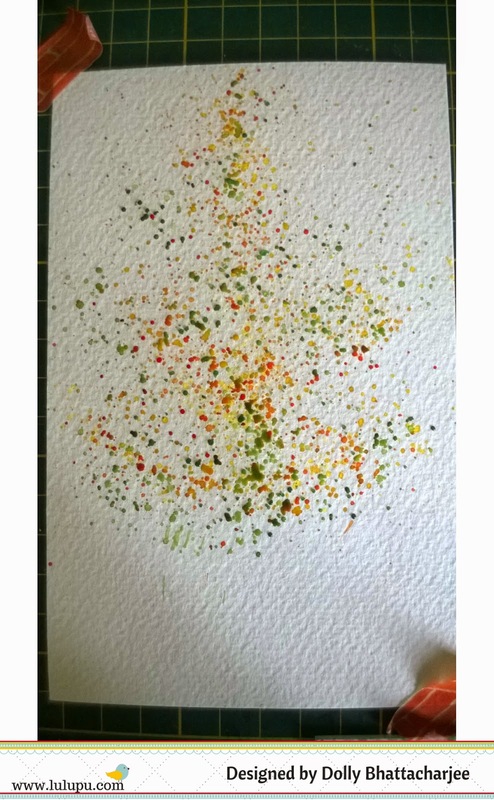 You can also control the amount of color by using less/more water and by tapping closer/ far from the paper. For tapping the paint brush, you can either use your fingers or a wooden spoon/stick. It helps controlling the paint splatters. 2. Once the colors are all tapped in, the real fun begins.. Bring out your mister and spray lightly on the paper till the colors start moving and blending. 3. Use the heat gun to set the colors dry. 4. 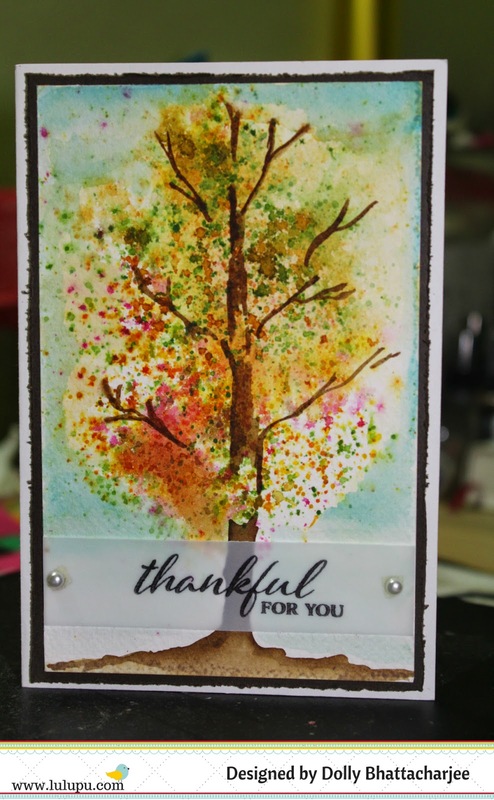 You can paint the branches and the tree trunk using a darker shade of watercolor. Voila, you triad tree is almost ready!! 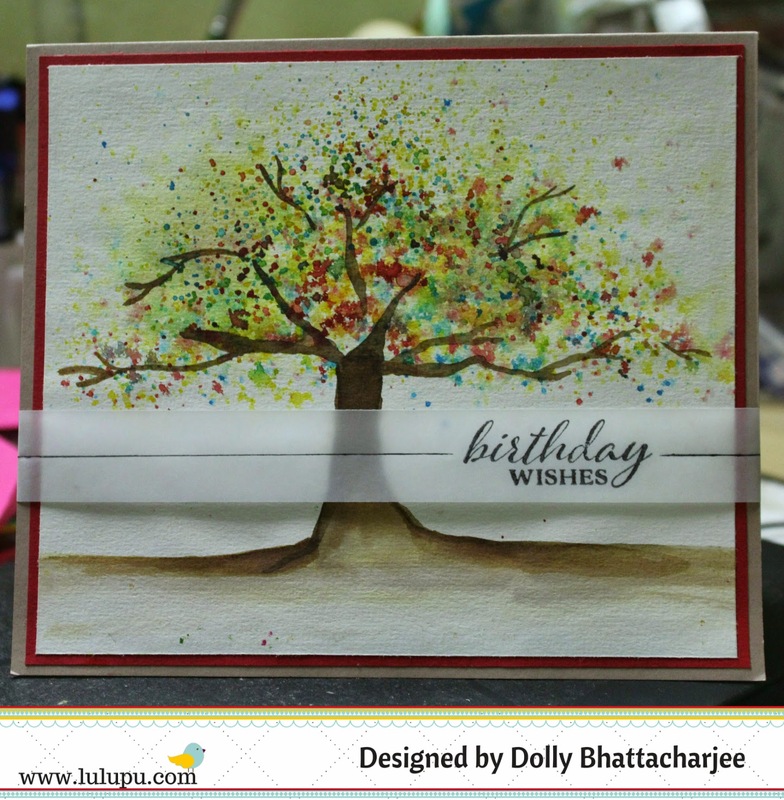 All you need to do is add your sentiments and pop it up on a card panel. 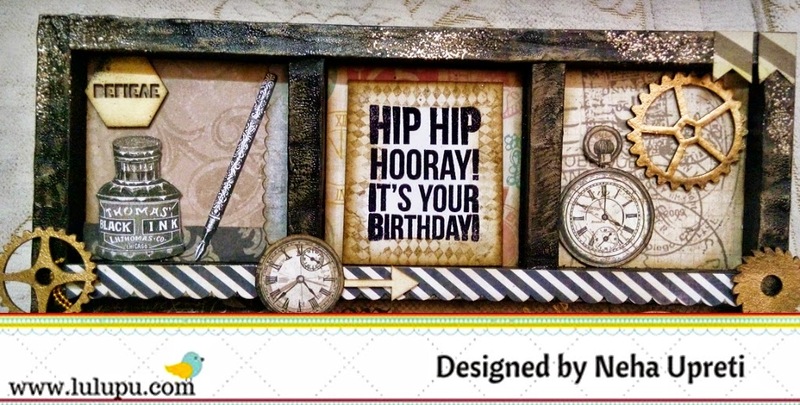 I have used various sentiments directly on the card / or on a vellum strip. So, let you imagination run wild in making these simple triad trees! You can also experiment with various colors to get different effects. I was aiming at a spring look and hence the bright colors. Hope you liked the cards and the quick tutorial. Don't forget that we have a month long challenge which is open upto 30 April 2015! The winner gets to take home some yummy products from Lulupu! Karuna here. I know am posting after a real long time but I just had to participate in this months fun Challenge to use water colour! I am totally addicted with the possibilities you have using this awesome technique! I so wanted to do a tutorial for you but with my busy schedule it just looked impossible. 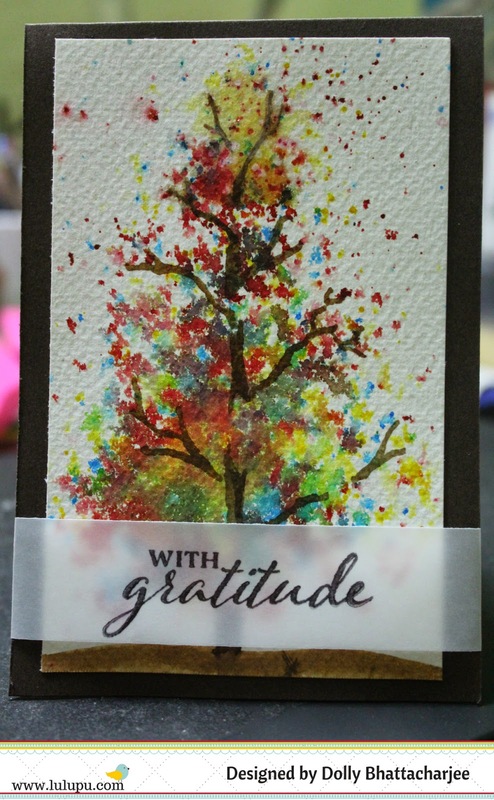 Nonetheless am going to help you through this masking technique that I have tried in my card below. 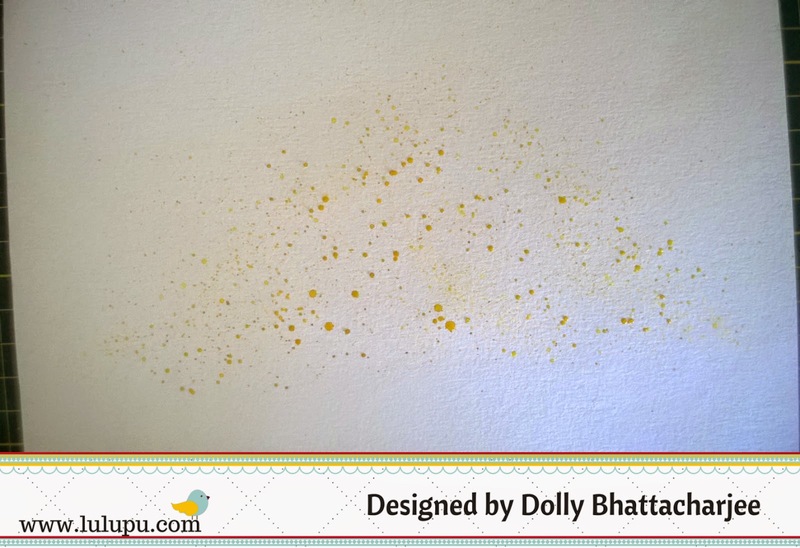 To begin with you must ensure you use a good quality watercolour paper to get the right result. I have used Brusto 300 gsm watercolor paper. To get the fine white borders, i stuck my paper on a mdf/thick cardboard and lined washi tape to all the edges carefully. 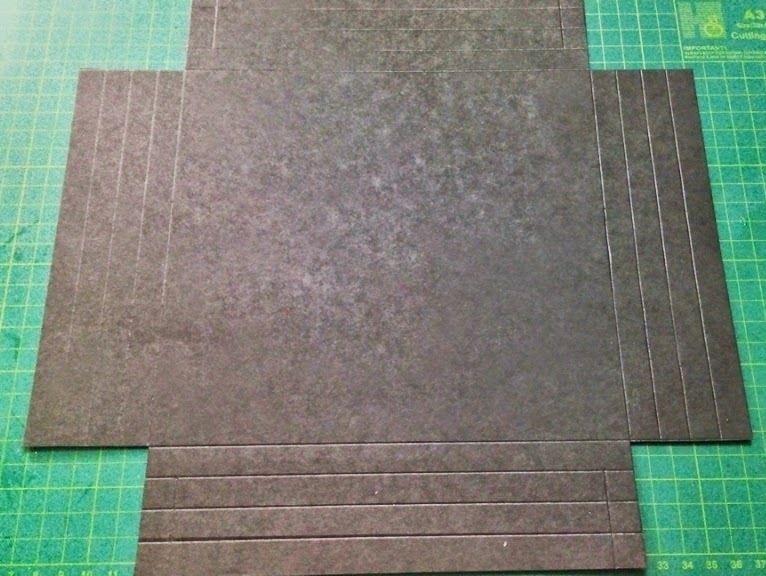 This will also help to hold the paper flat while you are working on wet and dry techniques. You can also choose the mediums to colour your images. Dont be limited with just plain old watercolours. I used a mix of Lindys Stamp gang sprays, distress stain and colorshine mists too! Now to creates a masking effect all you need to do is plan backwards. Here is how! That is what would be the first image and images that will be hidden behind. In my card i kept the butterfly as the focal image and the flower and leaves behind. 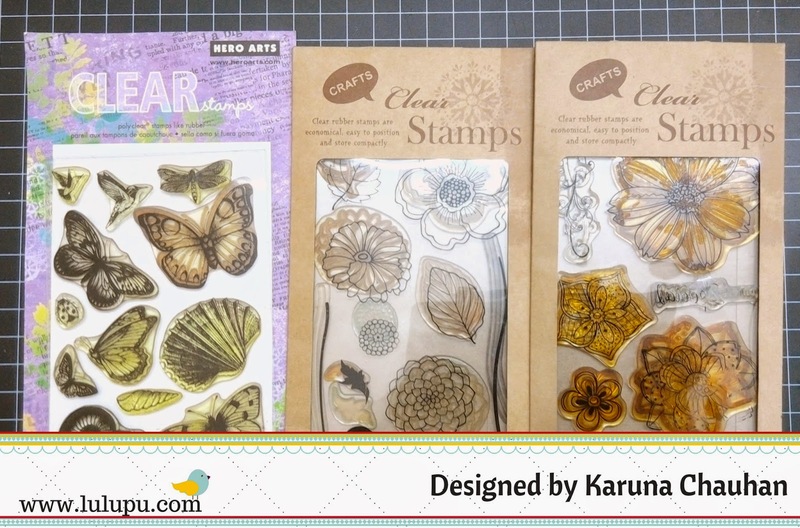 The trick is to first stamp the butterfly image with a archival ink as you will be using water. I used coffee archival ink as i wanted a subtle outline. Next stamp the same image on a post it note and fussy cut it. Stick this on top of the image on your card. 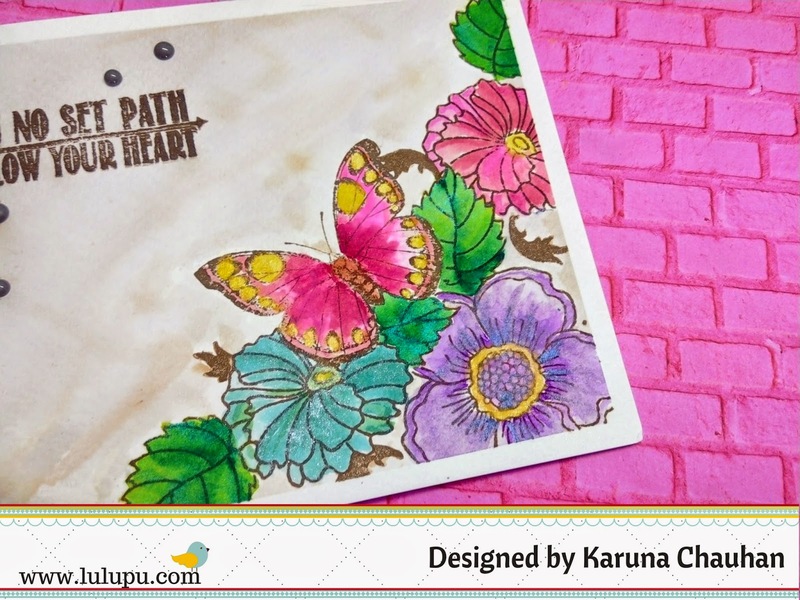 Now you can stamp the background flowers without worrying to stamp on the butterfly! 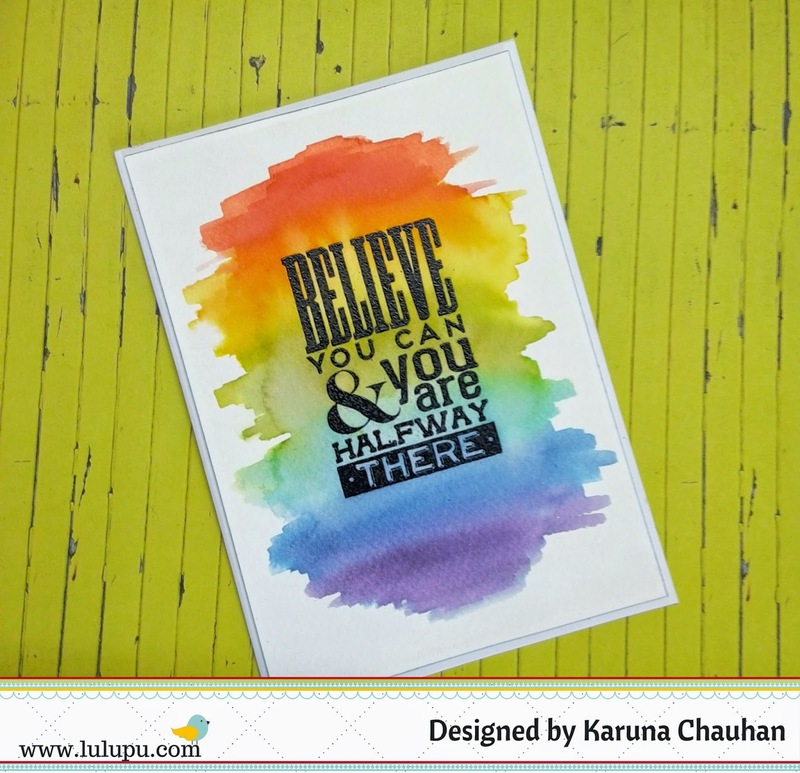 So go ahead and use post it notes, stamping and fussy cut to create further background layers. Now the fun part! 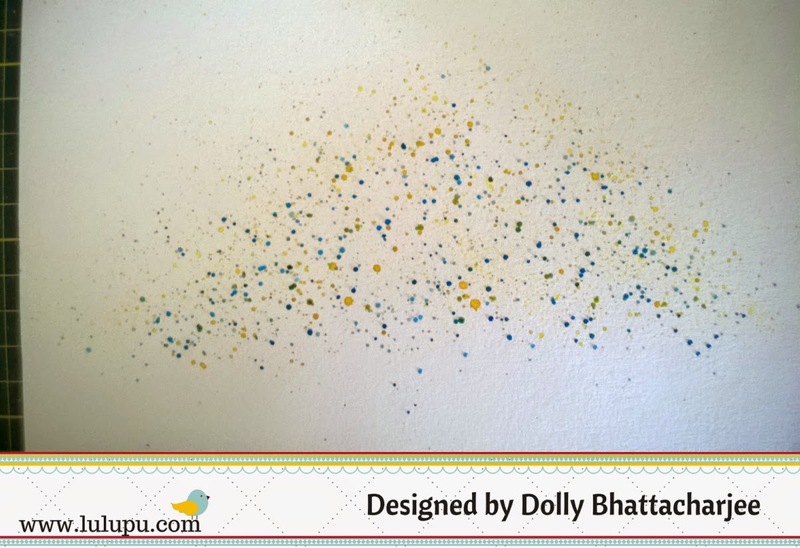 Use various mediums to create layers of colours. 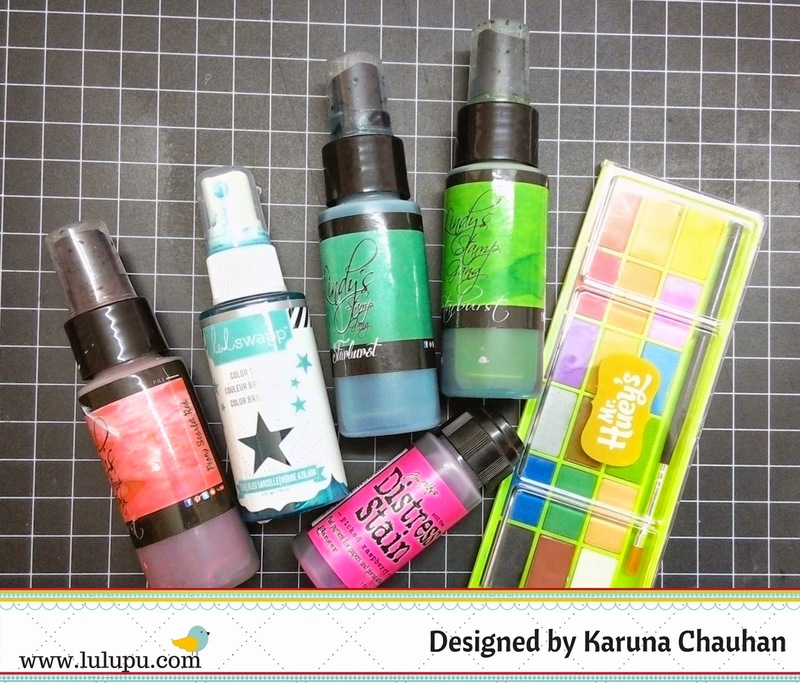 I love using my Koi Water Brush to pick colours from mist bottles directly. you can see the shimmer from the lindys starbust sprays too. Here is the close up of the final image. Then I have just heat set the card. Now I didnt like the plain old background so i added a little of a brown tone from my lindys collection which was very very diluted to tone the whites. This also uplifted the white border. I finished my card with a nice sentiment and some sugar dots! And to complete it i created a matching envelope using my WRMK Envelope Punch Board. I hope you enjoyed this quick post and do join us for this months challenge! As I sign off here's another card i made earlier last month! 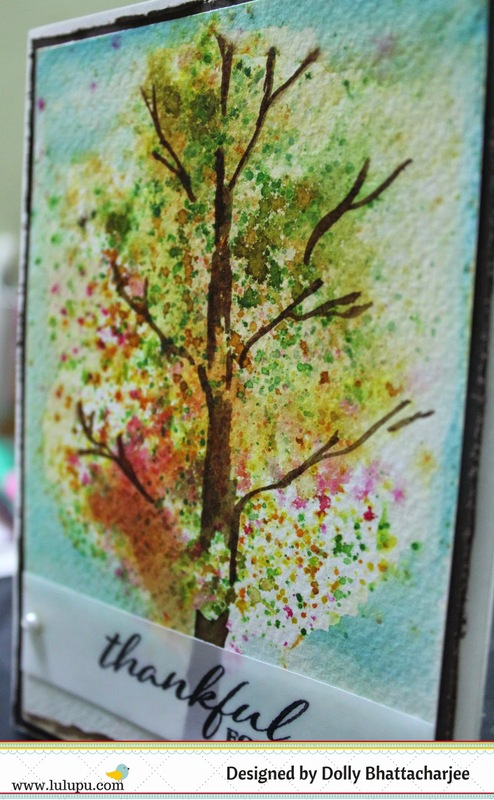 We have around 30 fabulous watercolour cards already linked up for this month's challenge. There is still time to dust out your distress inks / gelato / paints / watercolour pencil, or whatever watercolour medium you fancy and join the fun. I hope you haven't missed out on the fabulous techniques the DT shared this month. Acrylic paint + texture paste = thicker brush strokes. I didn't even mix the paint and paste completely. Load a flat brush with the above and just go swipe, swipe, swipe. Acrylic dries pretty quickly, so the colours wont disappear into each other but give a beautiful blended depth. I got a little more bold after this and mixed paint with sand texture this time. 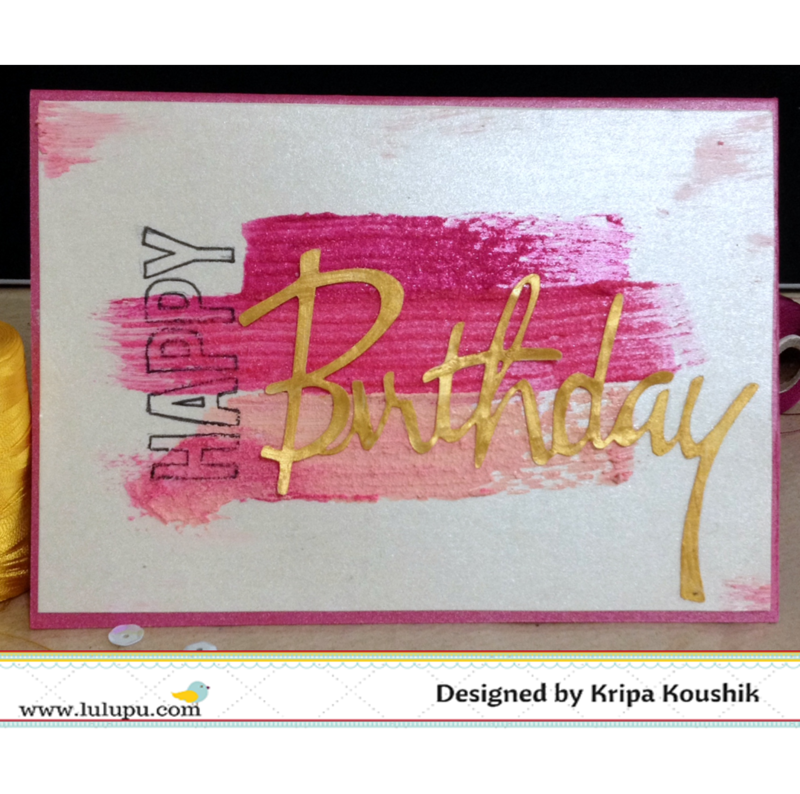 Three big, bold strokes and a little bit of stamping and this card was ready. 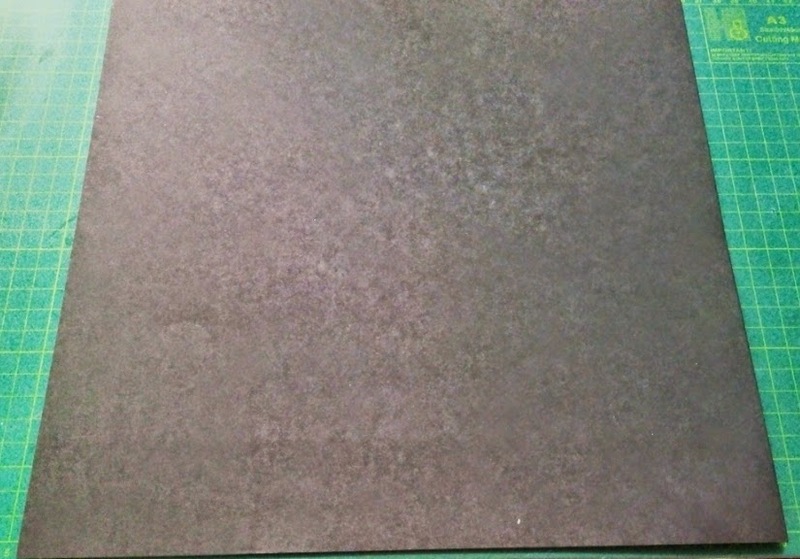 Here is a panel without and mediums added : you can see the paint doesn't have much thickness. Happy creating, see you all soon! 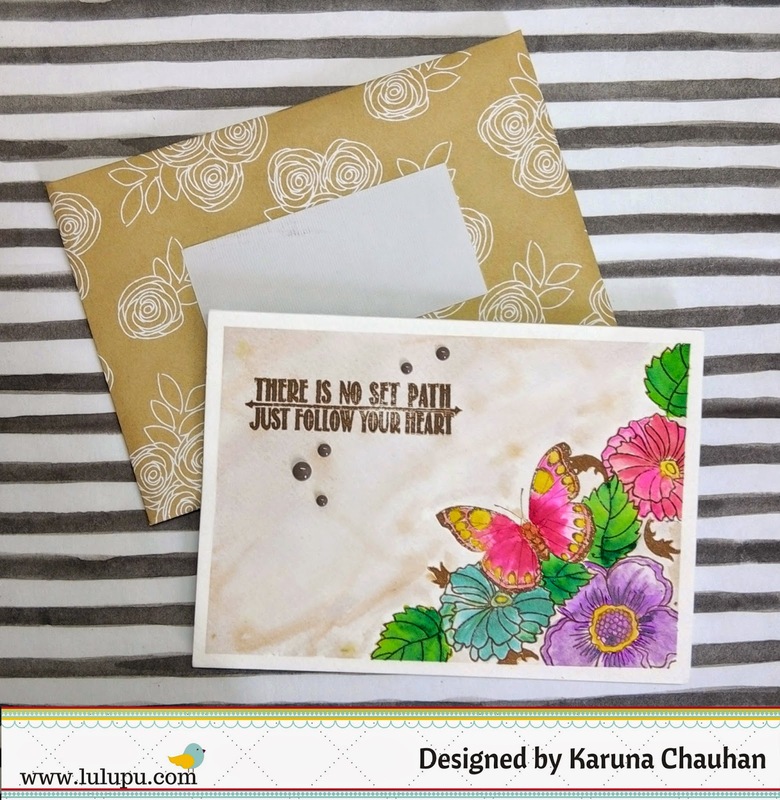 Pastels - DieCuts Stacks Cardstock 6"x 6"
Neha here. I think you guys are enjoying water- coloring very much as I can see so many entries for the current challenge. There is still a lot of time left for entering the challenge so take out your watercolors and get started. 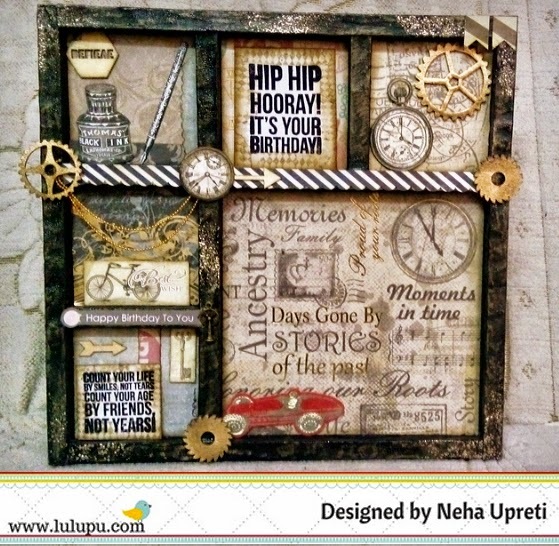 Toady I am sharing with you a tutorial on how to make your own shadow boxes using paper. 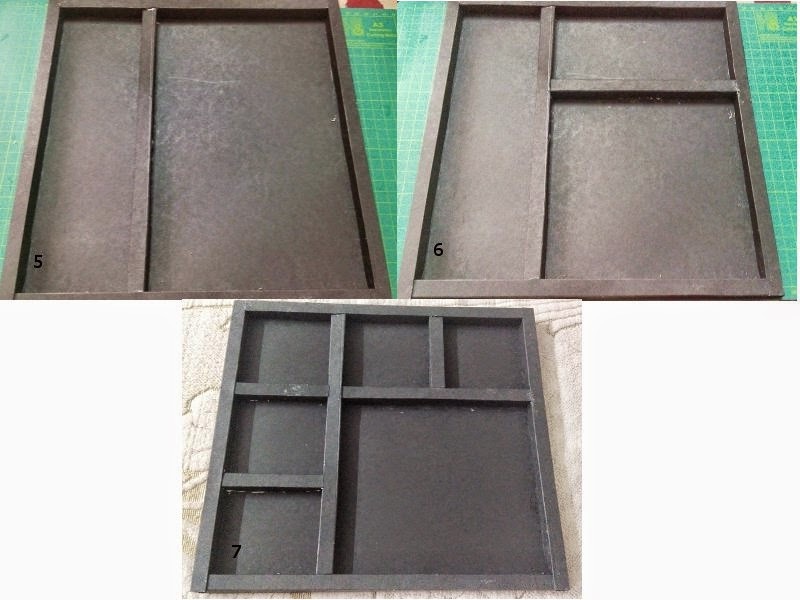 Here I have made a 12"*12" shadow box using a sturdy black CS. The whole shadow box has been made from scratch and it was very easy too. 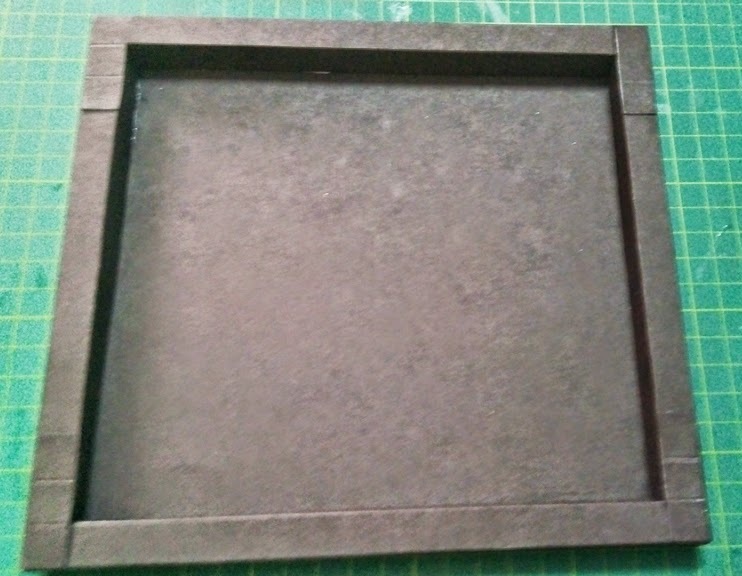 I have decorated shadow box in a masculine theme as I will be gifting this to my brother on his birthday. 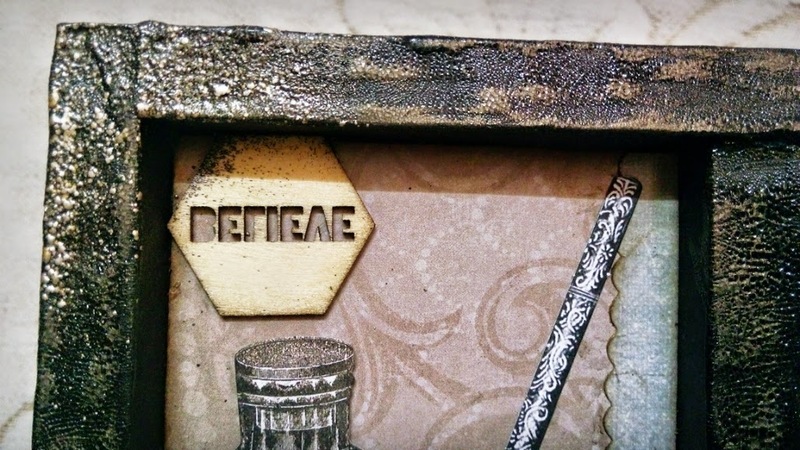 I have used Ranger Distress crackle paint all over the edges of shadow box. These days I am really addicted to using it (I am using it in almost each project I am making these days). Thereafter I have rubbed steam punk gelatos (iced chai and iced coffee) over it. This gave a cool effect! I also heat embossed on some places with golden embossing enamel. 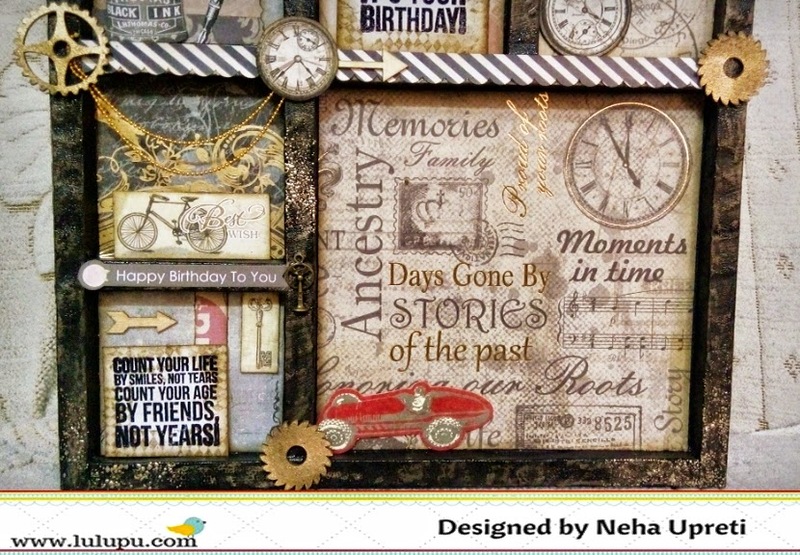 Then decorated it with pattern papers, gears (heat embossed with golden EP), Die- cuts, sentiment (stamped and embossed), wood veneers and chain. 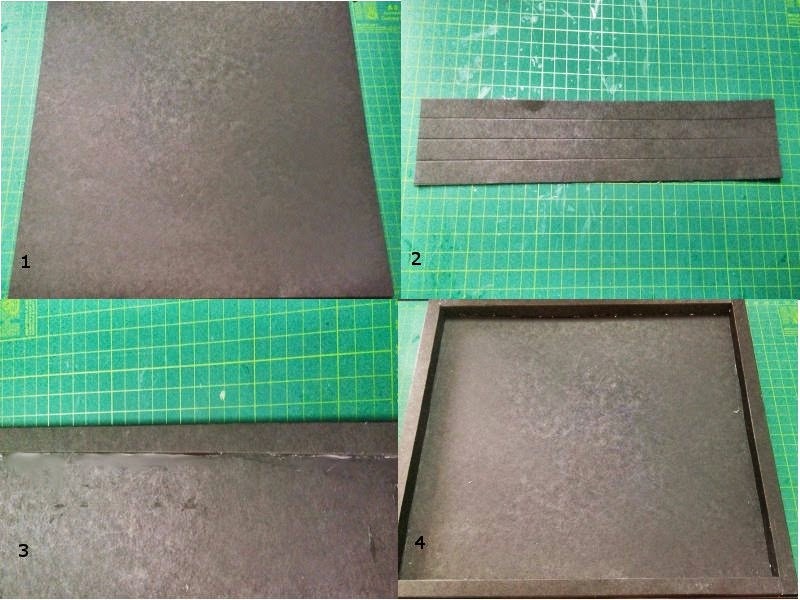 Here I have prepared a pictorial which will demonstrate all the steps from making a simple shadow box to the above one. Its a picture heavy post. 1. 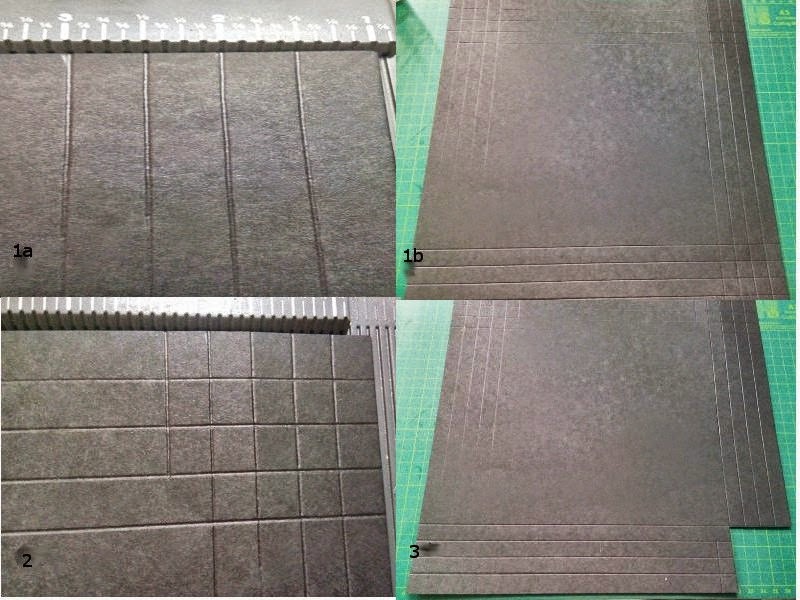 Take a CS (12"* 12") and score at 11-1/2", 11", 10-1/2" and then 10". Repeat this step on all four sides. 2. Now on one side score at 2-1/2" till the third scored line (as in the pic) and then at 9-1/2" to the third score line. Next, just flip the paper at 90° and do the above process again. 3. Cut out all the four corners. 5. Fold all the scorelines to form square shape and then glue down the side without the flaps first. Do it on the sides with flap too and lastly glue down the flaps too. Flaps will hold the edges nice and tight. 5. 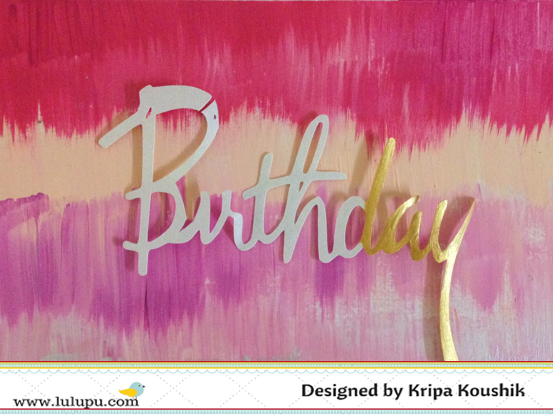 Decorate as per your choice with PP and embellishments. This makes a simple shadow box. Now we will see how we can make the one with sections. 1. For making sections in the shadow box, take a CS strip, measure the length in which it fits the shadow box. Tip: when you measure the length of the CS strip make it a little bit lengthy (by 1/8") so that it fits in exactly and no gap is seen. 2. 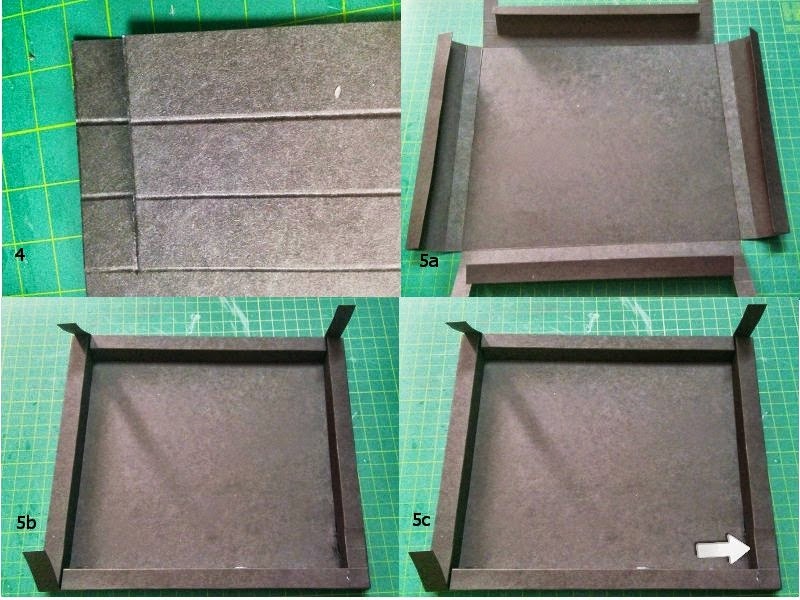 After cutting the CS strip in desired length, score it at 1", 1-1/2", 2", 2-1/2" and fold them with a bone folder to form a square shape and then glue them down on the shadow box at the desired place s we did in above steps. This forms the section in the shadow box. You can make as many as you want in the similar way. Just measure the length, cut the strip, score it, fold and attach. Final part is a 12"* 12" shadow box. Well the process is same as above, but here I took a 12"*12" black CS instead of making a shadow box. Then repeated the above steps of making sections. You can make them in any pattern you want. Just keep in mind that the CS you are using is a sturdy one. 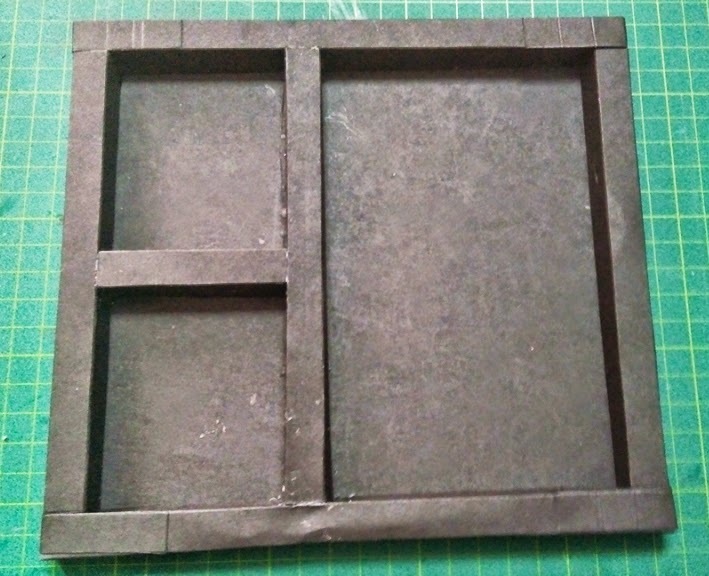 You can also make the backing of shadow box with a chipboard sheet to make it a bit more strong. So guys, I hope this tutorial will be helpful and you guys will give it a try! Do let me know if there is any confusion and don't forget to take part in our current challenge here!